FIAT: A Start&Stop system has been introduced on Fiat’s 1.2-litre petrol powered Fiat 500 city car. The system automatically turns the engine off when the vehicle comes to stop and the driver puts the car in neutral. Restarting is achieved by depressing the clutch pedal to select a gear. HONDA: At a recent press brief on the new Honda Insight hybrid powered car, a Honda technician suggested the way ahead was via hydrogen power rather than the limited range/performance electric powered vehicle as backed by PM Gordon Brown. The spokesman also hinted that future homes could be fitted with a gas fuelled power pack that would generate domestic electricity and also be able to refuel a hydrogen powered car within minutes. HYUNDAI: The Korean car giant has reported that it is the only major car manufacturer to improve in retail market share compared to 2008. Sales for the first quarter of this year were only down by 1.85% on last year - on a market that is down 29.7% overall. They cite the new small 130 and i110 models and strong private buying as major contributors to their strong sales position. JAGUAR: For the second year running the Jaguar XF has been voted the Best Executive Car at the What Diesel Magazine Awards 2009. The British car beat a number of prestige brands including BMW, Audi and Mercedes. LEXUS: The second generation Lexus Hybrid Drive version of the Lexus RX 450h will reach UK showrooms this July. Makers claim a segment beating 148g/km CO2 emissions level and up to 44.8 mpg on the Combined Cycle. MAZDA: An all-new range of compact Mazda3 models is due this May. Engine range will include a 2.2 diesel developing either 148 or 183 bhp and utilising a smart idling stop system to improve fuel economy up to 16%. TOYOTA: The new B-segment hatchback crossover Urban Cruiser model, due this May, will use Optimal Drive technology to reduce emissions and increase fuel economy. Both two-wheel drive and four-wheel-drive versions will be offered. VOLKSWAGEN: A GTI version of the new Mk V1 Golf has just been launched. Powered by a new 2.0-litre TSI petrol engine producing 207 bhp and using either a 6-speed manual gearbox or a DSG selectable automatic unit. It is claimed to be sharper and more powerful than any previous Golf GTI. Price range is from UKP22,210 to UKP24,300. They Don’t Come More Positive Than This! There is no shortage of terms to describe car that stand out from the pack. Motoring milestone, icon and classic are the most used terms and any or all of these can be used to describe the Audi TT Coupe and Cabriolet models, now in its second generation and continuing to woo enthusiasts around the globe. What better than to combine the charisma of the Audi TT with one of the most proficient 2.0-litre turbo diesel engines in the business to provide enthusiast class motoring with miser class economy plus a carbon footprint that should appease the save the planer pontificators? We now take it for granted that diesel powered prestige cars have arrived big time, underscored by Audi’s string of victories in oil fuelled race cars at the classic Le Mans 24-hour endurance race and evidenced by the use of these engines in all the top makes from Germany, Jaguar of Britain and Alfa Romeo of Italy etc. 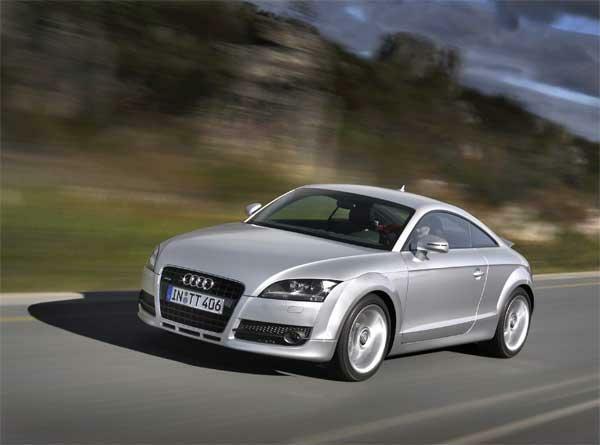 In the case of the Audi TT with diesel power there are plenty of positive aspects. By far the most important is its performance including an ability to return well over 50 mpg without compromising on a top speed in the region of 140 mph and an ability to reach 60 mph from rest in a mere 7.7 seconds. What is more this car really handles, admittedly in this case, aided by that highly regarded quattro all-wheel-drive transmission and a thoroughly developed all-independent suspension system, that ensures really positive road control under all conditions. A formula that should ensure driving satisfaction for both discerning and easy life drivers. As with every Audi TT I have experienced this one begs to be driven and for that purpose it comes with a positive acting 6-speed manual gearbox (no, you canâ€™t chicken out and have an automatic) and nicely weighted responsive high geared steering. This car could well be the cure for anyone claiming that driving, particularly in the UK, has got boring! This second generation TT is not only a better driving car than its ancestor but it is sleeker of line (a rear spoiler automatically rises when speeds of over 50 mph are reached to add to an already inherently strong degree of stability) and a bit bigger and roomier than before. To all intents and purposes this car is it is what I recall the Grand Touring cars used to be before the Coupe term became fashionable. In essence that is an occasional four-seat car majoring on high degrees of comfort for the front two occupants, especially the person behind the steering wheel while making clear that anyone else apart from small children are not exactly welcome. It is a formula that remains popular, so who can argue. Yes, the Audi TT Coupe is a true Grand Tourer that has a good sized tail-gate providing access to a passable luggage compartment that can be augmented by flat folding either or both rear seats. Just the job for that designer luggage! It is also easy to appreciate Audi’s successful emergence as a ˜must have” brand. Sit in the cockpit of this TT and there is feel good ambience created by a seriously comfortable driving position, a fully functional yet very attractive fascia layout, top quality trim material (plenty of brushed aluminium, of course), superbly contoured (leather upholstered/power adjustable) seating and excellent ergonomics apart from a is better positioned for left hand drive versions. Take it for granted this is a well appointed car but worth mentioning is the provision folding exterior mirrors and the lack of a rear wiper to clear the large glazed rear window of the morning dew. Those with business minds may well agree that a good car is one that makes a profit for its creator and in the case of this Audi TT it more than appeals to a heck of a lot of buyers they simply love it. I know, they keep telling me, so it must be a good car! Some rivals: Peugeot 407 Coupe V6 JHDI Sport UKP22,290m, Volvo C30 2.4 D5 Lux UKP21,105, Alfa Romeo Brera 2.4 JTD UKP28,395. TECHSPEC: Engine: Transversely mounted: Capacity: 1,968 cc, 4 cylinders, 16 valves, high pressure common rail turbo diesel, max power: 168 bhp/170 ps@ 4,200 rpm. CO2 Emissions: 139 g/km. Transmission: Four wheel drive, 6-speed manual. Suspension: Fully independent Brakes: Ventilated discs front, solid discs rear with ABS/HBD/ESP Steering: Electro/hydraulic power assisted, 2.9 turns lock to lock, 11.0m turning circle. Dimensions: Length: 4,178 mm, width 1,842 mm (excluding mirrors). Height: 1,352 mm. Weight: approx 1370 kg, Fuel tank capacity 60 litres/13.1 gallons. Range approx: 450 miles. Insurance Group 16. Price from UKP27,995.